Clipper City is currently operating as a day sail passenger boat in New York harbor sailing from South Street Seaport at Pier 17 on the East River in Manhattan. The Clipper City was first built as a cargo schooner just prior to the Civil War, then rebuilt from the original plans, on loan from the Smithsonian Institution, and recently refurbished. The new, restored Clipper City, with a length of 158 feet and a height of 118 feet , can comfortably sail 144 people - the most of any passenger sailboat in the United States. 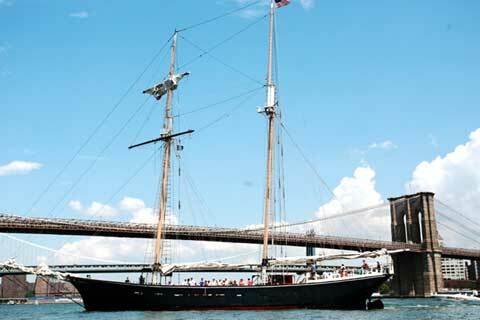 With her sweeping deck, full bar, and eight sails, this majestic schooner and its attentive crew now sail daily from South Street Seaport, providing guests with a unique way to see Manhattan. The original 1854 Clipper City schooner came from the shipyard of Manitowoc, Wisconsin, a town soon nicknamed "Clipper City" because of its growing reputation for shipbuilding. The plans for Clipper City are in the permanent collection at the Smithsonian, and a replica cross-section of the boat is on permanent display at the Wisconsin Maritime Museum. In 1856, the U.S. Nautical Magazine & Naval Journal reported that Clipper City could sail from Chicago to Port Washington, Wisconsin, a full 115 miles, in just seven and a half hours. Built to haul lumber, she was enormously successful in her time. Clipper City was decommissioned in 1890, but in 1984 naval architects DeJong & Lebet re-built her, with adaptations to meet modern safety requirements. The new Clipper City, a steel-hulled schooner carrying six fore-and-aft rigged sails and two square topsails on two steel masts, was operated as a Baltimore charter vessel for 20 years. She then fell into disrepair, but recently acquired and extensively renovated and rebuilt over an 8 month period. The ship that sails daily from Pier 17 on South Street has been carefully restored to match the beauty of her Civil War-era ancestor. She is currently the largest passenger sailboat in operation in the United States. The sailing vessel Clipper City is of all welded steel construction, having auxiliary propulsion by a single diesel engine. The vessel is topsail schooner-rigged, with fore and aft sails set from tubular steel main and foremasts, with the foremast additionally rigged with two (2) yards. An exceptionally long bow sprit, of steel construction, supports the head sails. It is fitted with a steel centerboard. The main deck is flush from the stem to just aft the deckhouse, with the helm set up on the poop deck. Below the main deck the hull is divided into six (6) compartments by five (5) transverse watertight bulkheads. These are: the forecastle, ahead the collision bulkhead; the crew quarters; the salon; the tank room; engine room; and lazarette. It is accessed by deck hatch, with welded rod ladder on the steel bulkhead. Found here are port and starboard wood plank storage pens in the forward portion. Lines, anchor rode, chain, and miscellaneous hardware is stored here. A tonnage opening just to starboard of the centerline allows access into the small after portion of the compartment, which shows loose fixed ballast, being short sections of railroad track, stacked to the level of the bottom floor. A plywood sole is in place above this. Coatings are in very good condition and fresh. The bilges are clean and dry. The bilge is fitted with a high water alarm. The crew berthing is accessed by forward facing trunk on the centerline. This space is built out with wood frame, typical 2 x 4 construction, with plywood bulkheads and overheads. It is laid out forward to port with a small enclosed tool room, and on the centerline is a 28 gallon hot water heater, with storage shelving reaching out to the skin on the starboard side. Next aft finds a bench vice and a work table to port just outside the louver entrance door to the shower stall, which has a composite deck, freshly painted steel bulkheads and overhead. To starboard is found a single large bunk, and open shelving to the side skin. Under the hot water heater, in the bilge against the forward bulkhead is found a 16" transverse thruster tube. The thruster motor and propeller have been removed. Aft on the centerline and down two (2) 12" steps is the crew bunks, two (2) each side. The enclosed marine head is to port, new fixture, plumbing and holding tank. On the centerline in the middle of the crew compartment is the 16" steel foremast, the base wedged into a 20" mast step on a 3/8" plate, supported by 1/2" transverse floors. The bilge forward is in very good condition, showing recent painting. The bilge aft is filled with fixed ballast in the form of short sections of railroad track. There is a suitable emergency escape fitted with an apparent watertight hatch aft on the centerline in the bunkroom. The entire compartment has been recently cleaned, painted, rewired and re-plumbed. A new hot water heater is installed. The salon is accessed by a forward facing trunk just behind the foremast, with companionway offset slightly to starboard, with 6' x 3' watertight hatch. This space compromises port and starboard sides, with a centerboard trunk down the middle, and mainmast set at the aft end of the compartment. On the starboard side forward finds a closet (formerly marine head), of painted plywood bulkheads. Just inboard, and under the companionway stairs, is a void space with a former black water tank. The tank has been recently cleaned. It is no longer in service. The starboard salon finds upholstered benches outboard, with louvered doors and hatches over for access to storage above and behind the long bench, which is generally plywood backed precluding inspection of the side shell. Underneath the benches are drawers which contain emergency equipment and life jackets. The inboard bulkhead is painted bead board plywood, as is the overhead. A large deck fiddley is fitted for ventilation. The deck is of plywood without covering. The plywood is new, unpainted, and generally satisfactory. Likewise, the upholstered bench shows moderate to heavy wear, and recent bilge painting has resulted in soiling by paint of upholstery, brass handrails and bead board paneling. These items should be recovered before opening this space to passengers. Head room is this space is approximately 6'6"; with varnished transverse beams and brass-plated, individually switched, overhead lighting. The port side finds an emergency escape all the way forward, followed by two (2) double bunks with mahogany bunk boards. This space generally has shiplap vertical varnished knotty pine paneling, in good condition. There is an overhead fiddley for ventilation. Next aft to port is the galley, which finds a Crusair air conditioning unit with local controls. Sheet stainless steel bulkheads surround a Toastmaster six burner electric stove with oven. Additional galley equipment includes a double basin stainless steel sink, and large Frigidair stainless steel refrigerator/freezer. A fiddley is set overhead the galley passage for ventilation. The galley has a painted plywood floor, and an area of stainless steel on the aft bulkhead, with miscellaneous shelving of painted plywood, with Marlite overhead. Next aft is the mess area, with large free standing table, and upholstered bench along the outboard bulkhead. Again the bench has storage behind, with display cases, and lift off storage under. Next aft and outboard to port is the electrical service locker, with 110 Volt distribution panels. Again, the bulkheads and overhead are painted bead board plywood, with transverse varnished beam effect. Lighting is by both ambient illumination through the fiddley, as well as individually switched overhead brass-plated light fixtures. Aft to port is the emergency escape via varnished bulkhead ladder. Aft on the centerline is the main mast step, in which the 16" steel mast is wedged. The step is in good condition. Through watertight door on the aft bulkhead of the salon, just to port of the main mast, is found the tank room and storage compartment, which was originally intended as the bridal suite when the vessel was constructed. Found under this space port and starboard sides of the centerline bilge, is significant tankage, with six (6) covers finding stainless steel bolts starboard side. This space is used for bar storage and includes a 3 keg refrigeration system, soda storage and pumps, water filtration, 80 gallon hot water heater, and miscellaneous bar equipment. The centerline bilge shows a high water alarm. The space is in very good condition, with freshly painted bilges, bulkheads and overheads. The tanks were all recently opened and inspected. The plywood decks have been replaced. The engine room is accessed by vertical ladder set in a raised trunk, just to port of the centerline, between the deckhouse and quarterdeck. It is generally in good condition, with recent cleaning and painting. Auxiliary propulsion is provided a by a Caterpillar model 3208T marine diesel engine, set on steel beds on the centerline. It is rated at 320 HP. Reverse/reduction is by a Twin Disc model 506 gear, of 2.96:1 ratio. It is a dry exhaust out the starboard quarter, heat exchanger cooled, with electric start by dedicated twin 8D 12 volt batteries. The exhaust is 5" schedule 40 pipe, all welded construction replaced 4/09 and newly insulated 5/09. A new sound reduction muffler was installed at time of exhaust construction with two stainless flex mounts. The engine has approximately 550 hours. Electrical power is by a Cummins model 4B3.9 four cylinder diesel engine as prime mover for a 40KW 240 volt generator. The emergency generator, mounted to starboard, being a Kubota Phasor of 21 KW. Auxiliary equipment includes two (2) Teel centrifugal pumps for fire and bilges, on a crossover line; one (1) engine-driven Jabsco bilge pump; two (2) Teel fresh water pumps; electrical distribution panels; two (2) seachests, one each side the main engine; 4 (3) 8D 12 volt batteries; one (1) Teel black water discharge pump; four (4) Racor separators, one for each generator and two on the main. The lazarette is in overall very good condition, with recent fresh paint coatings. The rudder tube appears in good condition and well installed with gussets in good condition. Access is by aluminum deck hatch, which is in good condition. Fuel is aft of the engine room, in two port and starboard integral steel tanks, with a reported capacity of 1000 gallons each. Potable water is stored in three (3) steel tanks aft in the engine room, with the port and starboard reported as 210 gallons each, and the center tank at 180 gallons. Black water (sewage) tanks are starboard in the engine room, integral with the bottom hull, with a reported total capacity of 800 gallons. Two (2) gray water sumps w/pumps are located, one forward (crew berths) and one galley of 10 gallon capacity with overboard discharge. The deck has recently been replaced with Hemfir planking, mechanically screwed into transverse beams on a raised wooden grid. The deck has been is in good and serviceable condition. The full perimeter of the deck is surrounded by a raised steel bulwark, which is the extension of the side shell plate, with heavy shear forward. This is strengthened by steel gussets, which are encapsulated in wood and painted a cream color. Openings are placed in the bulkhead port and starboard amidships for boarding through hinged double hinged gates. All the way forward is the bowsprit, being approximately 12" steel pipe welded to the stem of the vessel with steel dolphin striker and chain leads. Laid atop the bowsprit is a 10' long steel pipe sprit. A mechanical vertical windlass is forward, turned by pikes inserted into the winch head. The rig is of the topsail schooner type, finding a jib mounted on the headstay, followed by flying jib followed by staysail jib. On the foremast is the gaff rigged foresail, with 2 yards, supporting a single squaresail. The main mast, is fitted with the gaff-headed mainsail. 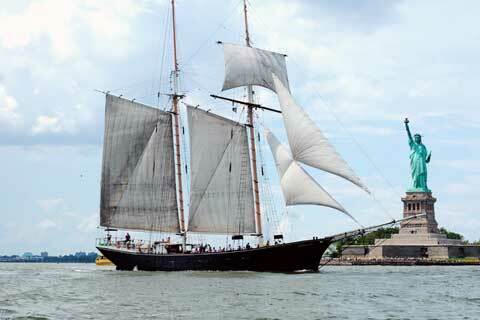 The sails were removed and sent to Doyle Sails Annapolis for full repair and renewal 3/09. The current sail inventory consists of: flying jib, staysail jib, foresail, squaresail, and mainsail. There are steel topmasts on both the main and foremast. Booms and gaffs are of fir and spruce construction, and secured by jaws and leathers to the masts. All rigging has been serviced and repaired / replaced through extensive rig overhaul (1/09 - 5/09), including disassembly of the running rigging, servicing of the turnbuckles on the standing rigging, re-lashing of the ratlines, and tuning of the rig in general. All shackles and blocks were taken down, taken apart and repaired or replaced as he deemed necessary. All one hundred twenty (120) blocks were inspected, and serviced, and three (3) were replaced. The standing rigging was completely wire brushed and slushed. The spruce yards and steel topmasts were carefully inspected in place. All turnbuckles on the standing rigging were disassembled, opened, cleaned, painted, and tuned with clench nuts. All running rigging was removed, inspected and repaired or replaced as necessary. The main deck finds a large deckhouse above the salon, which compromises the two (2) heads, with the beverage service bar and beverage storage. This space has been completely gutted, new decking set down, new beverage service equipment installed, There is a full custom mahogany bar with custom refrigeration, mahogany shelving, and ice storage. and new heads fitted out with tiled walls and decking, pressure assist toilets, floor drains, and bronze fixtures. The roof has been cleaned and recoated. Next, set below the quarterdeck, and above the engine room, is the Captain's cabin. The Captain's cabin is accessed by forward facing steel watertight door in a raised trunk. Forward to starboard is found the chart room, which finds chart table forward, and plywood bulkhead to outboard with code flag pigeon holes on the lower portion, the upper fitted for electronics. Next is the Captain's office, which finds bead board plywood bulkheads, painted plywood overhead with Mahogany beams. Mahogany book shelf and writing desk are built in along the starboard bulkhead. Curved bench seating is found aft, with storage under. Oversized solid panel door to port in the office accesses the very large Captain's cabin, which finds double sized hanging closet inboard, platform double bed fitted outboard, with varnished bead board plywood wall paneling, and tongue and groove overheads. The deck throughout the area is carpet and painted steel. Aft to port finds the Captain's head, which has been gutted out by the new owners. A recent cedar ceiling has been installed, but the remainder of the space is stripped back to steel bulkheads. The Captain's cabin is illuminated by overhead lights. There are bronze ports with dead lights fitted in the trunk of the Captain's cabin and office. An escape hatch is fitted in the Captain's stateroom with scuttle on the trunk top. The exterior is in very good condition. Paint coatings to the topsides, hull, bulwarks and deck structures are 100% and tight. The vessel was drydocked twice over the winter of 2008/2009, with metal thickness gauging of the underwater hull made, and new inserts made to deteriorated areas, to the satisfaction of the USCG. Fresh paint coatings and new sacrificial anodes were applied 5/09.